So far, I’ve written quite a bit about interacting with my older child, L., about food and eating. It’s natural, I think — he’s of just the age to be really developing his own palate, asserting his independence, and making his own decisions and requests about what goes into his mouth. However, feeding his brother, P., is an adventure of an entirely different kind, which deserves at least a bit of space here on Momma’s blog. P. is — how to put it? — a maniac. A sweet, hilarious, adorable maniac, but a maniac nonetheless. He’s the kind of kid who had to transition to the Toddler Room at daycare long before his first birthday, because he was trying to figure out how to escape the Infant Room and get to where the good toys were. A kid who managed, at 10 months old, to sneakily remove 90 percent of his clothing and drop it out of the stroller with such stealth that it was not until we reached the playground and were confronted with his grinning nakedness that we even realized he’d done it. (Cut to mental reel of us, trekking back along the road, picking up scattered socks, hat, shorts….) Kids like P. don’t sit still for long, and sitting to eat a full meal is just far more tedious than he can possibly endure. As a result, he’s one of those fickle, fidgety little people who seems to subsist on nothing more than 5 or 6 quality bites of food in a day, with the exception of breakfast. P. LOVES breakfast. He’s not a picky eater, though he does have strong preferences — he won’t eat pasta or rice, for example, and meat can be a hit-or-miss proposition. Beyond those items, though, if he’s planning to eat, he’ll eat just about anything you set in front of him. The issue is that we never quite know if eating has made it into his busy agenda, or if his calendar is too jammed with trying to drink from the toilet and determining whether his brother’s cup of juice would make a good hat to make room for a meal. P.’s bite-here, bite-there approach to food means that I spend a lot of time and energy trying to figure out how to make those bites as full as possible — full of calories (predictably, he’s in the 88th percentile for height, but only the 15th for weight), full of interesting flavors to stimulate his palate, and full of as many nutrients as I think I can muster. Not that I’m a nutritionist or anything, but I know enough to at least be able to sort of balance carbs against proteins, vary the colors of his fruits and veggies, and sneak in a bunch of things that are supposedly full of iron, calcium, and all that stuff you’re supposed to feed kids so they don’t get rickets or scurvy or whatnot. Also due to P.’s spotty performance at the table, when I pack his lunchbox, I tend to put in 5 or 6 items, in greater quantities than I think he probably will eat, because you never can tell what’s going to appeal to him. I have visions of him, wiggling impatiently in the bucket seats at the daycare lunch table, summarily rejecting the first 4 items with a swipe of his arm (yes, that’s really how he signals that he’s not going to eat something — by clearing the area in one fell swoop), until finally, something in the 5th or 6th container catches his eye and he deigns to stuff a few bits into his mouth before running off to ransack the block corner. However, the good news about the way P. operates is that it means I have full license to throw together whatever crazy concoctions I want, and there’s just as much chance that he’ll decide to give the new food a shot as there is that he’ll eat the blueberries he’s chowed on all week long. This week we had what I think was one of the most surprising successes in the “new food” area of P.’s lunchbox. Usually, I’ll get a note home from daycare telling me that he ate “some” or “none” or “a bit” of each item. Yesterday, the note came home covered in exclamation points and astonished proclamations of “ALL!” The object of my son’s lunchtime affection? Something round and green, folks, and constructed entirely of leftovers and pantry staples: the individual Spinach Bread Pudding. Preheat the oven to 400 degrees. Generously grease 12 muffin tins. In a nonstick skillet, briefly saute the spinach and garlic in the olive oil, just until wilted. Cool slightly. 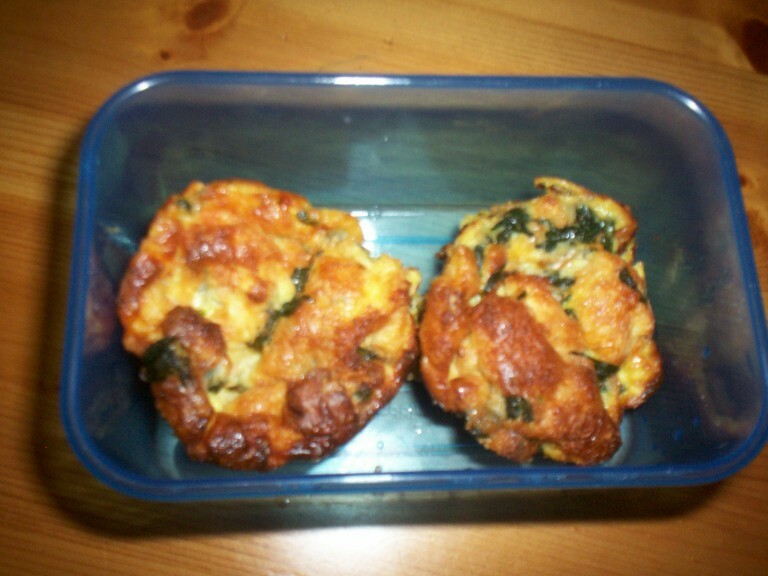 In a large bowl, combine the spinach, bread cubes, and cheese. Whisk together the eggs, milk, salt, pepper, and nutmeg. Pour over the bread mixture and mix thoroughly. You may, at this point, want to go through the mixture and separate some of the clumps of spinach with your fingers, to be sure that they get evenly distributed. Ladle 1/4 cup of the mixture into each muffin tin. Bake at 400 degrees until golden brown, puffy, and set. You’ll need to run a knife around the edges of the bread puddings before removing. This entry was posted in Lunchbox, Parenting, Veggies and tagged cooking, feeding kids, leftovers, Moosup River Farm, parenting. Bookmark the permalink.